Warning! 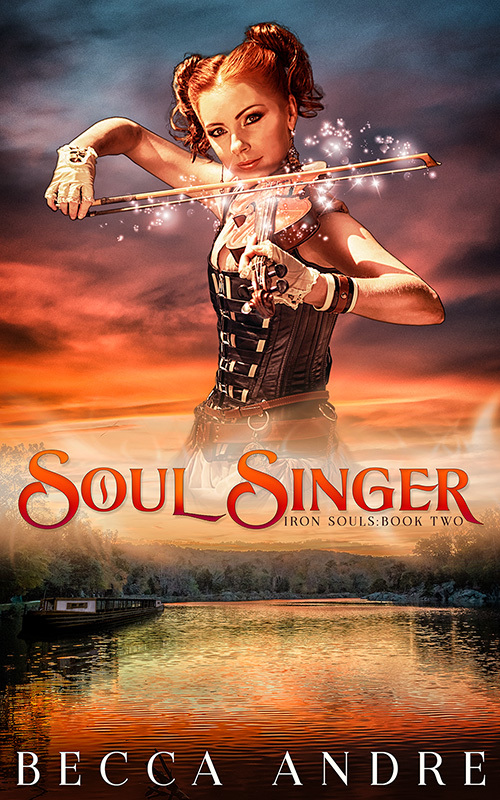 The stories in my Iron Souls Series are intended to be read in order. Reading them out of order will spoil the fun of an earlier tale. You can find the reading order, along with blurbs, covers, and excerpts of the other books here. Briar rested her elbows on the edge of the folding table, ignoring the wobble as she studied the map. It was Uncle Charlie’s map of the entire length of the Ohio & Erie Canal. She hadn’t pulled it out in years because she didn’t need it to travel the familiar southern section of the waterway. But things had changed. Now she would be traveling all the way to the northern terminus. It would be the first time she’d captained a boat on that part of the canal. Picking up her pen, she turned back to her calculations and checked for errors. She ran through it two more times before setting down her pen. The number of miles between towns was correct and her arithmetic accurate. Briar rose from her seat on the tiller deck rail. She’d brought the table and map up here to discuss the trip, but maybe she’d really come here for another reason. She needed to talk to someone. At the mention of his name, the little metal dragon climbed from her waistcoat pocket and scampered up to her shoulder. Eli didn’t immediately answer. Instead, he looked at the towpath where, two hundred feet ahead of them, Zach drove the mule team. The towline stretched back to the boat, bobbing a little with the tug of the mules. “What is it?” she asked Eli. Was he upset with her? Certainly he understood that she had been forced to obey Liam. Briar followed his gaze and saw Grayson climb up onto the deck over the stable cabin. He was alone, which was no surprise. Since the crew learned that he was a ferromancer, they had become reserved around him. He turned away, taking the catwalk across the cargo hold to reach the bow deck. The Briar Rose was a typical three-cabin freighter. With a cabin in the bow, midship, and stern, leaving the rest of the deck space available for cargo. The two cargo holds—large open areas between the cabins—were currently empty. After this errand was over, Briar intended to change that. Grayson took a seat on the bow rail and studied whatever he held. Briar couldn’t see from here, but it looked like a horseshoe. “What’s he up to?” Eli asked. “I’ll go see.” Briar turned to the catwalk and heard Eli sigh behind her. She really wished he would get over his dislike of Grayson, but she was beginning to think that was never going to happen. By the time she reached the bow deck, Grayson had closed his eyes and was rubbing his hands over what was indeed a horseshoe. A broken horseshoe. Briar hesitated. The wrinkle on his forehead suggested concentration, and she hated to interrupt. She took a quiet step closer. The dull metal changed. The rust didn’t fall away, but seemed to smooth out. Grayson, his eyes still closed, aligned the two halves of the horseshoe, and a faint golden nimbus glowed along the crack. At the same time, the rest of the shoe was changing color from a lackluster rusty brown to a polished iron gray. She glanced over at Lock who still sat on her shoulder. The little automaton was watching with interest. Grayson stopped running his hands over the now unbroken horseshoe, his shoulders slumping as he took a deep breath. Lock shifted on her shoulder. A mechanical whirr answered her. No, he wasn’t asleep. Grayson opened his eyes and looked up at them, a slight upturn of his mouth suggesting amusement. He held up the shoe. It was a fully formed horseshoe; the polished iron winked in the August sun. “I found a broken shoe and thought I’d fix it.” His British accent no longer sounded so foreign to her. “Oh.” She couldn’t come up with a better response. “I’m guessing you couldn’t have done this before your final casting?” Before he’d been forced to come into his full power. “Hmm.” Sometimes, his magical displays made her uneasy. “So is this going to be a hobby for you? Like whittling?” she teased, trying to make light of his bizarre abilities. He turned his head. His good humor becoming a frown, he stared at the towpath ahead of them. She followed his gaze and saw Zach pulling the mules to halt. He waved at them, signaling that he had some reason to stop. Maybe a mule had slipped a shoe or there was an obstruction on the towpath. There was a bend in the canal just ahead of them, and the team currently blocked her view. “Steer us toward the bank,” she called back to Eli who had a hand up to shield his eyes against the glare of the sun. He’d seen Zach’s signal as well. “Has a tree fallen across the path or something?” she asked. “No. Not a tree.” A coolness in Grayson’s tone gave her an instant chill. “Wh—” She didn’t get to finish her query before he sprang up on the bow rail, then leapt to shore, clearing the eight-foot gap with ease. She jumped up on the rail, as well, but didn’t follow. She couldn’t make that jump without taking a run. The hatch opened in the deck behind her, and Jimmy climbed out of the bow cabin. “Captain?” He glanced toward shore. They were almost even with the stopped mules, but Grayson and Zach were no longer in sight. The boat bumped softly against the bank, a glancing blow designed to slow them and not damage the bank—or the boat. Just before Eli brushed the bank again, Briar jumped across to the towpath. Jimmy followed her an instant later. The mules, now a few yards behind them, looked up with indifference before turning their attention back to the grasses growing along the verge. “Aye, Captain.” Jimmy turned back to the mules. They didn’t look like they’d be going anywhere, but if something startled them, they were still hitched to the boat. “Lock, you’d best get out of sight,” she said to the little dragon still perched on her shoulder. He scampered down the front of her waistcoat, morphing into the pocket watch before dropping into her pocket. She jogged along the towpath. The occasional rumble of male voices carried back to her, but she didn’t catch the words. She hadn’t seen anything that would cause Zach to stop. Had he heard something? She rounded the bend and saw Zach and Grayson just ahead. A third man lay face up on the towpath, Grayson kneeling over him. Perhaps they had heard his cry for help. Grayson was blocking the man from her view, so she couldn’t say for certain. “Hey,” she greeted them, stopping beside Zach. Briar took a step to the side and gasped as she got her first good look at the man on the ground. He lay on his back, his dead eyes to the sky, and his bare chest ripped open. She took a step closer, noticing the iron tang of blood that filled the air. Aside from the occasional animal—that was usually cleaned and dressed before she saw it—Briar had never had the opportunity to closely examine the internal workings of a body. Silver glinted within the hole, and Briar stepped closer, her curiosity overcoming the horror of the situation. “He’s soulless?” she asked Grayson. Grayson reached into the man’s chest and pulled out a small white envelope. The sight of an envelope in such a location both outraged her, and turned her stomach. She had never been squeamish, but something about the corpse unnerved her. Maybe it was those foreign bits of metal that were now part of his flesh. Or perhaps it was the horrified look on the dead man’s face. Grayson turned the envelope in his hands, and she saw the single word written on the front. Drake. She crossed her arms. “That was left for you.” Drake was his ferromancer name. “So it would seem.” Grayson rose to his feet. She was about to ask if he was going to open it when he spun to face the thick stand of trees on the side of the towpath. “Bloody hell,” he muttered. Briar turned, as well, but saw nothing that would elicit such a response. “I see you,” Grayson called out. A man emerged from the trees dressed in a dark cloak with a hood that covered his head and obscured his features. The garment looked distinctly out of place on this hot August morning, even in the shade of the trees. “You left this for me?” Grayson stepped forward to meet him. Briar stilled at the mention of Solon’s name as well as the completely alien sound of the man’s voice. It was so cold, devoid of any inflection or emotion. “It refutes the logic of delivering it if I tell you what the missive contains.” The line might have been funny if it hadn’t been delivered in that dead voice. “It seems the boy has grown,” the cloaked fellow said. The man appeared to study Grayson a moment, though Briar couldn’t see his face. He reached up and pushed back his hood. “You remember me.” There was no joy or satisfaction in the man’s voice. There was no emotion at all. Just as there was no human flesh on his face. Instead, his face was made of smooth, perfectly contoured silver metal. “It’s the eyes,” Grayson answered. Unlike the voice of the man he faced, emotion colored Grayson’s words. The man—Farran—had no response. He regarded Grayson with dark gray eyes flecked with gold, but they weren’t human eyes. No whites showed in his eyes. His irises stretched from lid to lid, like an animals. “Have you a response for Solon?” Farran asked. “I haven’t yet read his missive.” Grayson gestured with the envelope. “You can’t run from this, Drake.” Farran gestured at himself. Was he threatening Grayson? Briar tensed, expecting Grayson to command Lock to form the silver armor as he had when he’d fought Solon, but Grayson merely regarded the man in silence. “I shall await your response.” Without another word, Farran turned away. Pulling up his hood, he stepped into the trees and was gone. “What was that?” Zach whispered. Briar crossed her arms, frowning at the trees where the man had gone. She did not want to accept that such a thing could be Grayson one day. “He was a ferromancer?” Zach asked. Perhaps he’d thought the man a construct, like Lock. “Huh. So his construct is a wolf.” Ferromancers were named for the shape their constructs took, which was why Grayson’s ferromancer name was Drake. It meant dragon. “Did he lose it?” Zach asked. “It’s part of him once more.” Grayson walked back to the dead man. Briar swallowed. She remembered Grayson saying that he couldn’t become a monster without all of his soul. That was another reason he wanted to separate from Lock. “What if this Farran comes back?” Zach asked. “He completed the task given him.” Grayson dropped to a knee beside the body, then held out a hand over it. “What are you doing?” Briar asked. “Him, not it,” she corrected. Grayson looked up, his eyes meeting hers. She wondered if he wanted to ask if she would still use the male pronoun for him after he devolved. Remaining silent, he turned back to the body and lifted his hand over the gory mess that had once been human. A golden glow illuminated the dead man’s open chest cavity. The silver organs and veins began to crumble, and the light grew brighter. Grayson closed his eyes and tipped his head back. He held that pose, and just when Briar was about to speak his name, he fisted his hand, and the light winked out. He bowed his head until his forehead touched his fist. He lowered his hand and looked up. She pulled in a breath as she met his gaze. Unlike Farran’s alien eyes, Grayson’s were still human, but there was something inhuman in those blue-gray depths. “I’ll need a shovel,” he told her, his voice cold and nearly as devoid of emotion as Farran’s had been. “What if he has next of kin who are looking for him?” Zach gestured at the dead man. “He’s been dead a while,” Grayson answered. “You mean, he’s been soulless a while,” Briar clarified. “Yes.” He gripped the man by the feet and dragged him toward the trees. She gave Zach a nod, and after an uncertain glance at Grayson, he hurried away. Intent on his task, Grayson didn’t watch him go. Briar followed him several yards into the trees until he dropped his burden. “Are you sure this is the right thing to do?” she asked. She watched him a moment. “I’ll play for you once we finish here.” She still didn’t understand why her playing the fiddle helped him, but it did. It seems to drive away the coldness of the ferromancer and return his humanity. “That isn’t necessary.” He shrugged off his waistcoat. She held out a hand, and he passed it to her, his gold watch weighing it down. His cool gaze held hers, and she fought off a shiver. When he was like this, he was so different from the man she knew. “Captain?” Zach called out to her. Grayson turned his attention to rolling up his sleeves. A moment later, Zach and Jimmy joined them. “Ben’s watching the mules,” Zach told her. She suspected Zach had given his teenage brother that task to keep him from seeing this. “Jesus,” Jimmy muttered upon seeing the dead man. “I know.” She patted Jimmy’s arm, glad Eli hadn’t joined them. He didn’t do well around blood and gore. “Ah.” Jimmy’s gaze shifted to Grayson. They had all witnessed his colder moments. She hesitated, wanting to ask if that really had been a command, but she didn’t want to discuss that in front of Zach and Jimmy. Settling for a nod, she turned and headed back to the boat. “Another ferromancer is after him?” Eli demanded when Briar told him what had happened. “I thought I’d buy a new boat and…burn this one.” The thought made her sick. This boat had been her home almost her entire life. Grayson had given her close to two thousand dollars—enough money to buy a new boat. “He said the money came from Andrew.” Grayson had been going to build locomotives for Andrew’s new business—before Solon had shown up and made Andrew soulless. The frown on Eli’s face didn’t lift. “So be it. I accept full responsibility.” Rolling her eyes, she opened the hatch and climbed down the ladder into her cabin. At the moment, ghosts were the least of her worries. The fire Grayson had lit in the stove for breakfast had gone out, but the cabin hadn’t cooled much—even with the windows open. The midday meal was often something that didn’t require the stove, but it would need to be lit this afternoon to prepare the evening meal. Would it be any cooler the further north they went? She had heard about huge amounts of snow on the lake in the winter. Would the summers be milder? Musing on these questions, she turned her attention to slicing the summer sausage and bread. She tried to focus on these mundane thoughts of the weather, but her mind kept drifting back to the ferromancer on the towpath. Was he an example of what it meant to devolve? What did that mean—besides having more visible metal? She wanted to learn more, but she didn’t want to ask Grayson. She had lunch ready when he stepped through the door from the cargo hold. “I take it the deed is done?” she asked when he didn’t speak. Dirt streaked his white shirt, though the glint of water on his hands suggested that he had washed up. They kept soap and a basin by the rain barrel for that purpose. “It is done,” Grayson agreed in his unaffected monotone. He walked to the table and dropped to a knee to pull out his trunk. With four crewmen who weren’t family, the boat’s bow cabin—the bunkhouse—was full, so she let him store his trunk here. Grayson selected a clean shirt and placed it on the table. Without comment, he rose to his feet and unbuttoned his shirt. She started to speak, to tease him about just making himself at home, but remained silent. In his current state, he wouldn’t get the joke, or he would give her a stiff answer. He shrugged off his soiled shirt, and since she was a little behind him, his back was to her. Oblong silver disks, reminding her uncomfortably of rivets, ran down his spine. Contoured, overlapping plates of the same bright metal overlaid his shoulder blades, or maybe even replaced them. Was it just her imagination, or did they encompass a larger area than the last time she had seen his back? Yesterday. She moved closer to the table. In front of him now, she eyed his bare chest, but saw no more metal. It left the sole blemish—a livid red scar down the center of his sternum—glaringly visible. He looked up, his cool eyes meeting hers. Embarrassed, she reached past him to her open fiddle case lying on the table. The instrument was tuned and the bow rosined. “You don’t need to do this.” He pulled on his clean shirt. “Yes, I do.” She drew the bow across the strings, creating a long, quivering note. Grayson buttoned his shirt, his nimble fingers working their way up from the bottom. She launched into a series of scales, trying to find the music within her. Grayson had told Liam that she was a soul singer, a talent reserved for the ferra, the females of the ferromancer race. Briar didn’t know where she had come by such a talent since, as far as she knew, her parents had been human. Grayson’s fingers stilled, and he bowed his head. That’s when she realized that she’d stopped playing scales and had begun an original composition. This was how it worked. She had to play from her heart, from her soul, to help him. She imagined herself reaching out to him. She shared her…humanity, trying to drive back the inhuman within him. The alien…thing she saw looking out at her through his eyes. How she longed to stop this process that clearly terrified him. Her thoughts returned to the other ferromancer. The devolved one. It broke her heart to imagine Grayson ending that way. The world would miss his wit, his boyish enthusiasm over his inventions, and most of all, his smile. Would this amputation he planned to get in Cleveland help? And the bigger question: if he hadn’t met her, would he still have these concerns? He had been willing to die rather than let Solon force his final casting on him, the event that kicked off his devolvement. Then she’d been forced to take his construct, though she didn’t fully understand why he found that so upsetting. She would never use the connection for ill.
She continued to play, trying to find answers where there were none. How could she ever make any of this right? His words pulled her back to the moment. No, not just his words, his tone. The cadence, the inflection. She had done it. He was human again. “Or something like,” he amended. As it had in the past, it seemed he heard her music as clear as he heard her words. She pulled the bow from the strings, allowing the final note to carry. Grayson stood before her, his shirt buttoned to his waist, leaving the scar on his chest visible. He lifted a hand to her face and she stilled. It wasn’t until he wiped her cheek that she realized she’d been crying while she played. She bowed her head, embarrassed. Wasn’t it bad enough that she had to show him her soul? Now he got to see her bawling like a little girl. “None of this is your fault,” he said. She choked on a sob. “Come here.” His arms came around her, and to her surprise, he pulled her into a hug. She tensed, but the relief that his words brought relaxed her, and she slumped against him—though with her fiddle in one hand and her bow in the other, she couldn’t hug him back. She leaned back to stare up at him. “At least, that’s what I’ve been told,” he added. Her gaze fell to the scar down the center of his chest, visible through his open shirt. The scar he received when his heart had been taken from him and used to give Lock…life. She transferred her bow to the hand that held the fiddle, and in morbid fascination, reached up to run her fingers over the raised, pink flesh. Grayson sucked in a breath. “You’re implying that I’m not?” She lifted her chin. “Yes, I do.” She held his gaze. He grinned, a mischievous twinkle lighting his eyes. The coldness was gone as if it never existed. His expression sobered as he watched her, then his gaze dipped to her mouth. A knock at the door was followed by a rattle of the knob. “Captain?” Eli called out. Grayson took a step back, and Briar spun to face the door, suddenly feeling like she was twelve again and Eli had caught her in some mischief. “Sounded like you were done in here,” Eli said as he stepped into the room. “Yes.” Briar turned away to place her fiddle in its case. The notion that the others could hear her playing bothered her. Did they hear her soul the way Grayson did? “Table’s set up.” Eli frowned at Grayson, though Grayson didn’t see it. He had turned his attention back to his shirt buttons. He just smiled and retrieved his waistcoat from the spare bunk where she’d laid it. “Then hop to it,” she said, trying for some semblance of normalcy. He gave her a graceful bow, then moved over to collect the baskets she had already packed. Humming softly, he left the cabin. She studied him, trying to decide if he was being evasive. “What is it?” His expression was perplexed. “Should I have recognized it?” No, he wasn’t being evasive. “I don’t want to be anything else.” Her frustration turned to anger. “This is the life I want. The life I’m fighting for.” And messing up. “I know.” She also knew he was wrong. She couldn’t talk to him about any of this. She frowned, not willing to accept that—even if Grayson had suggested as much. She wanted to argue that she felt there was more she could do, but Eli wouldn’t humor her. He wanted to be free of Grayson. “You just hear music when I play for him?” she asked instead. “I’m trying to puzzle out why it helps him. How does my playing return his humanity?” And how did he understand every note as if she had spoken to him? “You play really well. I know it makes me happy to hear you play.” His face might have blushed beneath his tan. “The rest of the crew, too,” he hurried to add. “Thank you.” At least it didn’t seem that everyone was hearing her soul. “Let’s go eat.” Eli shifted his weight from foot to foot, perhaps anxious to get up there before there were only crumbs left. Eli’s forehead wrinkled in concern, and he hurried for the door. They docked in Newark early in the afternoon. Briar sent Zach to the toll office to pay their fees. Should there be any wanted posters up, she hoped Zach could talk them out of another run-in with law enforcement. She didn’t understand the particulars, but when Grayson had repaired Zach’s damaged voice box, he had given him a new ability. Zach could make people believe what he said—even if it was a total lie. Grayson and Jimmy had walked over to the farmers market to restock their stores. Grayson had been saying something about a cobbler, though she hadn’t been paying close attention. She had been studying the docks, on the lookout for policemen. So far, she hadn’t seen any. When Eli complained about her wearing a hole in the deck with her pacing, she retreated to her cabin. She had cleaned it earlier that morning, so with nothing else to do, she pulled Uncle Charlie’s old trunk from beneath her bed and went through it. She hoped to find another map or travel logs from his trips along the northern part of the canal, but she soon became distracted by some paraphernalia from her childhood. She pulled out a well-worn rag doll and set her on the small shelf beside her bunk that served as a nightstand. Lock had been watching her from his perch on the lid of the trunk, but hopped over to the shelf to examine the doll. “I didn’t have a cute automaton to keep me company as a child,” she told Lock. “I had Sally.” She waved at the toy. Lock moved closer to give it a tentative poke with his nose. Briar laughed at the little dragon’s antics and turned back to the trunk. Among her uncle’s old ledgers, she found another familiar item. It was a worn copy of Alice’s Adventures in Wonderland. She opened the cover and read the familiar inscription. To our little wonder on her first birthday. Love, Aunt Aggie and Uncle Liam. Her gaze returned to the inscription. She had seen it dozens of times—the book had been a favorite—but now, she truly thought about it. Her first birthday. Her father hadn’t died until she was three, which was when she had gone to live with Uncle Charlie on this boat. She hadn’t realized that Liam and Agatha had known her prior to that. She thought they were friends of Uncle Charlie. She rose to her feet and set the book on the shelf beside Sally. Taking a small wooden jewelry box from a shelf above her bunk, she opened it to reveal the most recent item Liam had given her: a small silver gun. It was a Scourge weapon designed to take out ferromancers and their soulless henchmen. Liam had given her that gun in case Grayson devolved to the point that she needed to end him. Briar reached out to touch the weapon when a knock at her door made her jump. She closed the box and returned it to its shelf. “Come in,” she called to Zach. Lock flew to her shoulder as she left her alcove for the main part of the cabin. “How did it go at the toll office?” she asked as Zach stepped into the cabin. “I thought it went well, considering.” He handed her a rolled piece of paper. Puzzled, she unrolled it, then blinked when she found her own likeness gazing back at her. Above the image—a reproduction of a portrait Andrew had once forced her to sit for—the word wanted was written in bold print. Beneath the picture was her name, a description of her boat, and an offer of a two hundred dollar reward. Andrew’s contact information was listed at the bottom. “What name did you give?” Briar asked. He couldn’t just make one up. Every boat and its weight was recorded at every toll house. “Your father’s boat,” she whispered. Zach’s family had died in that boat. “You used your voice.” Briar couldn’t decide if the notion impressed her, or scared her. “Maybe it’s not him—and not the boat that’s wanted,” Zach said. Company? What did that mean? A friend from another boat? Was it just her imagination or did Eli sound worried? Had the toll collector remembered the poster? Had he come to the docks? Lock rubbed her cheek with his, picking up on her anxiety. “Coming.” She met Zach’s equally concerned gaze and they headed for the door. “Lock?” she reminded him. He scampered down her waistcoat, morphing into the watch as he slid into her pocket. Briar stepped out into the sunshine. Eli stood a few feet away, and at his side, a familiar woman. A woman who looked very out of place on the deck of a canal boat. “Molly?” Briar stared at her cousin’s wife. “What are you doing here?” And a much bigger concern: was Andrew with her?